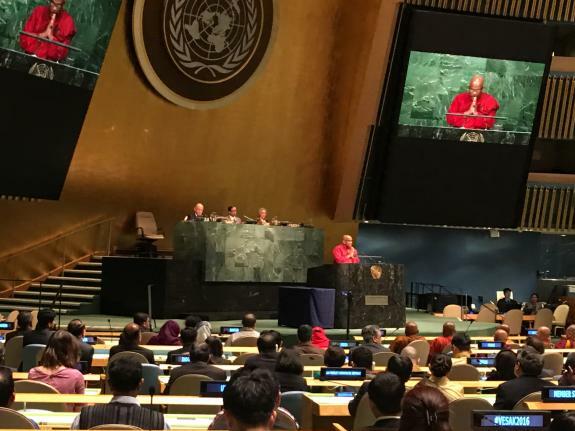 President Sally Kader was invited to celebrate Vesak Day 2016 at the United Nations. "Vesak", the Day of the Full Moon in the month of May, is the most sacred day to Buddhists all around the world, as it was on the Day of Vesak two and a half millenia ago, in the year 623 B.C., that Guatama Buddha was born. It was also on the Day of Vesak that the honorable Buddha attained enlightenment, and it was on the Day of Vesak in his eightieth year that he passed away. The General Assembly resolution 54/115 of 1999 recognized the Day of Vesak internationally to acknowledge the contribution that Buddhism has made for over two and a half millenia to the psirituality of humanity. The day is commemorated annually at the UN Headquarters and other UN offices, in consultation with the relevant UN offices and permanent missions.